Here we have an audience hall with a throne made of mother- of - pearl surmounted by the usual nine - tiered while canopy, the mark of a duly crowned king. At the back of this audience hall is yet a living quarter. 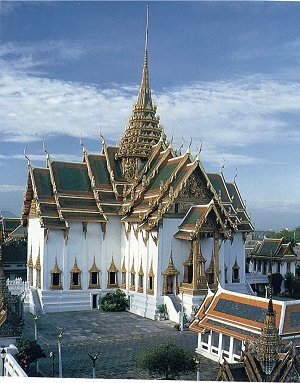 All are built in pure Siamese architecture of perfect proportions. In front of this group is the Disrobing Pavilion-Abhornbhimok-which was reproduced of Brussels in 1958. Wat Saket is an undistinguished temple except for the Golden Mountain or Phu Khao Thong, on the Wast side of the Golden Mountain puts everything back in perspective and offers views over Rattanakosin Island that are simply stunning. The artificial hill was created when a large Chedi under construction by King Rama III collapsed because the soft soil beneath would not support it. 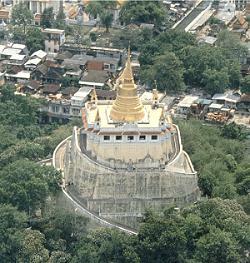 The resulting mud-and-brick hill was left to sprout weeds until King Rama IV built a small Chedi on its crest. King Rama V later added to the structure and housed a Buddha relic from India in the Chedi. The concrete walls were added during World War II to prevent the hill from eroding. Every November a large festival, held on the ground of Wat Saket, includes a candlelight procession up the Golden Mountain.